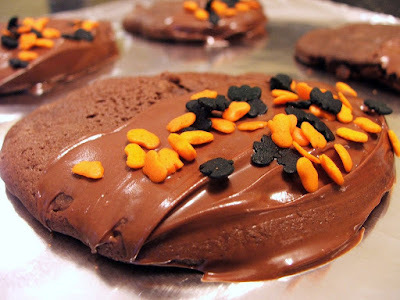 I was in a festive mood yesterday so I decided to make some Halloween-y cookies. I adapted a cookie recipe to my liking, and they came out oh so delish! Cream butter, sugar, egg and vanilla until well blended. Combine cocoa and buttermilk and chocolate syrup in a separate bowl, beat until smooth. Add to creamed mixture. Add flour, baking soda and salt, beating just until blended. Stir in chocolate chips. Drop dough by teaspoonfuls onto ungreased cookie sheet. Bake at 350 for 15-18 minutes or until centers are almost set. Remove from cookie sheet while hot, let cool. In a double broiler (or microwave) melt the remaining milk chocolate chips until smooth & creamy, spread or dip half of the cooled cookies in the chocolate and add sprinkles, place on wax paper while the chocolate sets. Eat and try not to devour them all in one setting!